My 2017 Summer Happiness Bucket List! 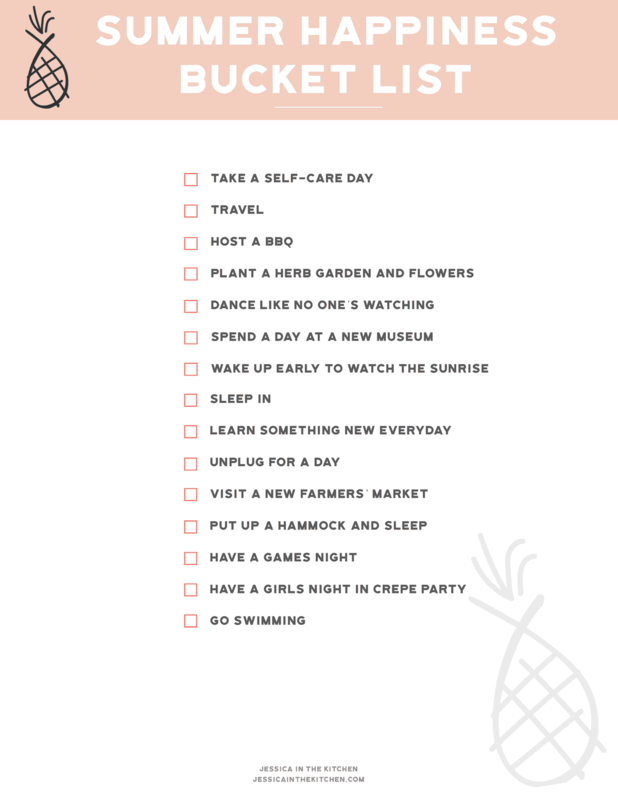 I’m sharing what truly makes me happy plus a free printable template for you to make your own bucket list! Happy July!! I’m back with another Out of the Kitchen post. I’m kind of just letting my heart guide me with this, so if you want more of these posts let me know! P.S. If you’re doing the 7-Day Smoothie Challenge, then happy Day 1 of the challenge! I know that summer started back in June, but July has always felt like the real start of summer to me. Maybe it’s because it’s still bright outside at 6 pm, we celebrate our anniversary and travel plans are coming into their final prep stages, but July truly is summer! I’m really trying to bring back that joy that I once felt as a teenager on summer vacation, into the everyday adulting life. Summer should be special for all of us! You may have noticed that I’ve been on the theme of happiness this summer, and there’s a really good reason for that. I’ve always known how important happiness was to me, of course, but it wasn’t until a few weeks ago that I started to actively reach for it more than I ever have in my life. It was a question the Mr. asked me that really changed my entire outlook. The Mr. reads a lot, like 6x more than I do (and I read a lot) and he came across a question in a motivational online story that I didn’t know would really rock the way my goals were headed this year. What do you need in this life to make you truly happy? No really, when you stop, take a quiet moment and think “WHAT in this life, do I NEED, to make ME, truly HAPPY?”, what comes to mind? In fact, don’t google that question, because then you’ll only get answers from what others deem will make you happy. In these moments, you need to not tell yourself what you need, instead you need to hear from yourself what you need, to be quiet enough to actually hear it. I know, it sounds kind of weird, but I really do mean it. I always knew that a blanket statement of “money and a stable career” didn’t make me happy (which by the way, if that truly makes you happy, that is OK), but I knew that having enough money to travel the world, and growing my business to a point where this was achievable actually was. What I love about the author of this online story is that he said to make the list yours. YES it is okay if having a nice car is on the list, because it’s your list. But just ensure it’s what you know in your heart you need to be happy, and not what the world is always telling you. Then say the list out loud. Keep it on your phone and view it often. Print it off and keep it somewhere private, or public if you’d like. Manifest that list into your life. Very soon, you’ll start to examine your life and slowly align your thoughts, ideologies and actions to achieving the things on this list. Sounds like, well, magic right? Well, ever since finishing Elizabeth Gilbert’s Big Magic, I’m an even bigger believer of this. So I followed the author, and I made my list. He warned that the list may start out long and flooded with some things that we think would made us happy. But little by little, we would whittle it down to what our heart knows is true. P.S. – this is scary sharing!! 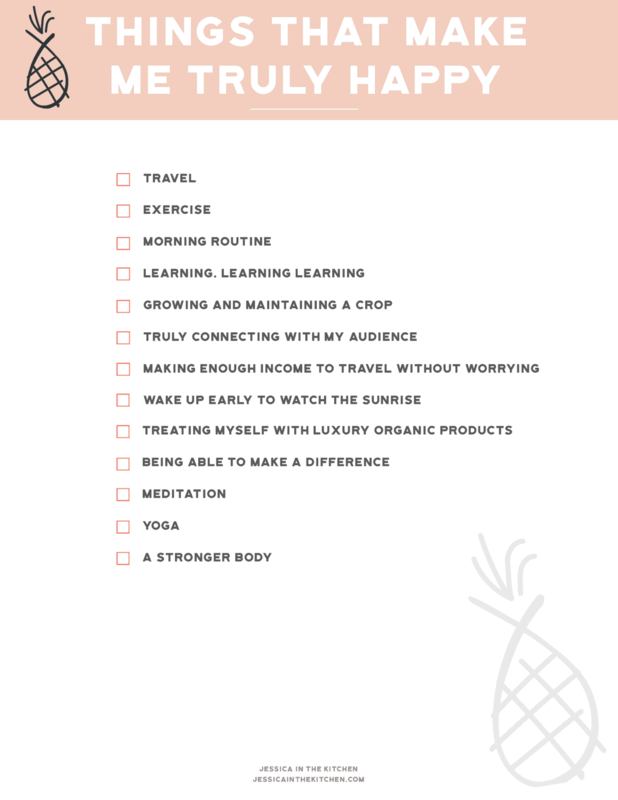 But ever since making this list, which I personally consider to be a life vision board, I’ve seen how I’ve shifted the way I have approached several things. This list grows for me every day, and it’s a true reflection of what makes me happy. Now, to the great stuff. I knew that in order to really achieve this list, I would need to make a bucket list of some sorts to make this into a list of fun activities. Summer is supposed to be fun, right?! 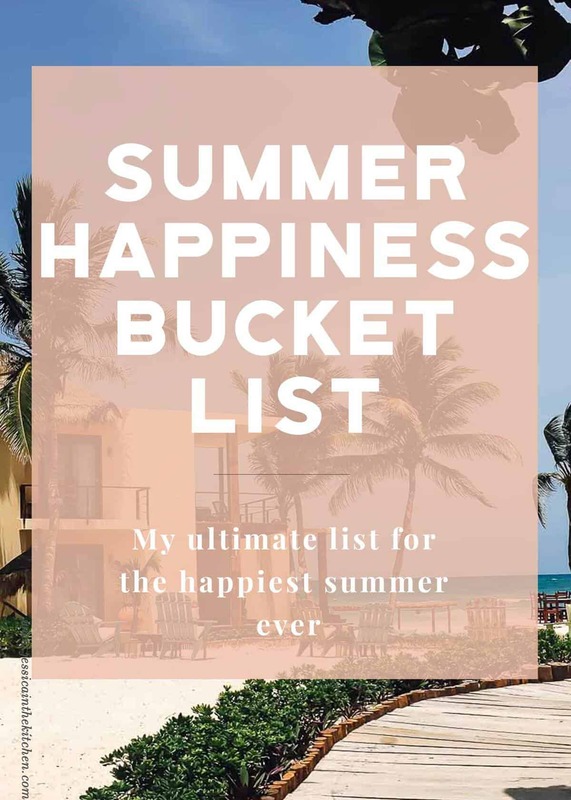 I don’t remember the last time I made a summer bucket list, so I turned my bucket list into a summer happiness bucket list – things I wanted to do this summer, with zero pressure to achieve them, that I know would better me, my happiness and my life. Ready for the list? My mental health is so incredibly important to me. If you’re a regular reader, then you probably know that I suffer from anxiety, and stress does not treat me very nicely. It’s important for me to maintain my meditation practice, to pray daily and to practice yoga. These things complete me and my soul! I’m literally having a mini-dance party writing this – I want to have a day where I drink smoothies, do yoga until I decide I want to stop, meditate for an hour and do a nice, long devotional. Essentially, a day where I say, thank you Jessica for all you do, you deserve this day off to rejuvenate. When I say I love travelling, I mean I really love travelling. Immersing myself into a new culture is my absolute favourite thing to do on earth. We don’t travel inside of Jamaica enough! Next weekend we’ll be travelling for our anniversary, and in August we’ll be in London! It’ll be the last time that Usain Bolt will run ever (sad face) so my whole family and I are going to watch him race! We’ve been to London before for the Olympics in 2012, and I can’t wait to go back! Le Pain Quotidien was my favourite restaurant in Kensington! What do you recommend I do in London when we aren’t at the races? They call the Mr. the Grill Master!! I will of course leave the grilling up to him, but I can’t wait to make the cocktails, the summer desserts and the starters!! We’ve done BBQs before and ate like kings with the amount of flavour that BBQ infuses. P.S. this Balsamic Grilled Vegetables is my favourite way to enjoy grilled veggies. Jessica aka I aka plant mommy is already growing a herb garden and a few other veggies, but I want to not only maintain it, but add some decorate flowers to the mix. When I’m at my parents house, I head out to the backyard and pluck some flowers. Their garden is so beautiful and I want to have that feeling in my own home too! It feels amazing knowing you grew something from scratch. This one is so funny, because it’s the first thing that came to my mind. Today I put on some throwback tunes, my favourite kind of music, and I danced. Like, danced to the point of sweating and laughing and slightly-aching joints. It was SO MUCH FUN. I want to do that again, over and over and over. I’m a serious museum lover, to the point where art can make my teary. I know, cliché right? It’s so true though – I like to think that art, music, creativity it all goes hand in hand. I get so inspired by the work, and knowing that someone put their everything – heart, soul and love – into the piece that we get the privilege of looking at. We plan to take a day in London to go to a museum! The Mr. and I have done this a few times, and every single time, I leave smiling for hours. We are so privileged to get a beautiful view just 20 minutes from our home, and I want to do this again this summer. Oh my gosh! I don’t think I’ve slept in late since college! I want a day where not only does no alarm wake me up, but I can wake up, then go back to sleep just because. I think we all deserve a morning like this, a kind of lazy day of sorts. I am pretty much a learning geek – I love love love to learn! I’ll keep you updated on what I’m watching/reading/consuming this summer! Friends…can we all take a day like this please? I know I need a real technology detox. I plan to take this day very very soon. I’ve taken just a few hours to unplug and it felt absolutely amazing, so I can’t even imagine what a whole day would feel like! P.S. you can do this in stages, which is what I plan to do. I love taking photos for memories and reading on my Kindle, but if I can go airplane mode for all the social media madness, that would be amazing! Also on my London list! I love seeing new fruits in different countries/states/parishes. I’m really excited to see what I discover at a London farmer’s market! Oh my gosh, I’ve done this before and it’s just absolute bliss. If you don’t have a hammock or access to one, I think even just sleeping on a chair, sofa, beach lounge or anything of the sorts on a cool evening outside, with nature all around you will give you this feeling of bliss. I love a great games night! My little brother always beats us at Monopoly, like since forever, so my aim isn’t even to win. I just love the laughter, fun and memories that come out of this evening. P.S. put the cell phones aside for this one! One of my girlfriends just came back from a year in France and promised to show us/make crepes for us at our next girls night in. Well, I was sold at ‘crepes’ so I am honestly bursting with excitement thinking about this night. All the fresh fun fruits, hazelnut spreads, and everything else for this fun night! We always say we’re going to put on a movie, but end up spending in the deepest, most heartfelt conversations, often ending the night laughing until tears! Any crepe topping ideas? I love swimming! I did synchronised swimming competitively in high school and I am so comfortable in the water! I’ve swam only once all year, once, and I definitely need to go swimming so many more times!! I’m printing this where I can see it daily to inspire what I do, to ensure my actions are working for my happiness. Want to make your own bucket list after you’ve made your happiness list? I want you to too! I’ve included a template for both, so that you can download it, print it off and fill it in! What do you need in this life to make you truly happy? What’s on your bucket list? Let me know in the comments below, and happy summer! If you make a bucket list, let me know! Another awesome, awesome post Jessica. I am loving these out of the kitchen posts so much. They are really resonating with me almost as if they were written for me specially. This post on happiness made me so happy and I really mean it. It made me think, realise that there are things I can do to make myself happy and I am feeling so excited about filling the bucket list for myself. I have a quote on my desk that says “something to do, someone to love and something to look forward to – the three grand essentials of happiness”. This bucket list is going to give me things to look forward to :). Btw, I don’t know how I missed the smoothie challenge post, it sounds fun, I am heading over to that post now to sign up. Thank you for this post and for making me so happy. Aww thanks so much for your comment and I am SO glad that you enjoyed this post!! I really hope the bucket list helps you to manifest those things you can do to make you happy. By the way, I LOVE that quote! I am definitely putting it on my wall of quotes, thanks so much for sharing that. Re the smoothie challenge I hope you enjoy!! You can join in whenever you can, and it’s available free forever so you can do it again and again whenever you want to. You’re so very welcome, and thank YOU for making me so happy with your comment! !